Sometimes you just need to get out and ride. Not because you’re trying to get away from anything. Quite the reverse, because you’re trying to get towards something. Yourself. Don’t get me wrong, the last few Wannabees club rides have been great, even the ones in the rain. But this weekend I needed to ride, and with a proper grown up evening planned in Cape Town Saturday evening followed by a night in the Grand Daddy Hotel, Saturday morning was always going to be my best opportunity for riding. The weekend club rides can be a bit too frantic for my tastes, too much pent up energy from the working week blasting off at a heated pace. With a cold start to the day forecast, but fabulous sunny weather later I decided to fall back to a solo ride starting at a more relaxed 8am. In the end, it was a shade after nine as my wheels rolled out of the gate, accompanied by a “ride safe” from Yoli and a “are you going to go large fast daddy?” from Ben. One thing I did keep consistent with a club ride was starting out down the hill. 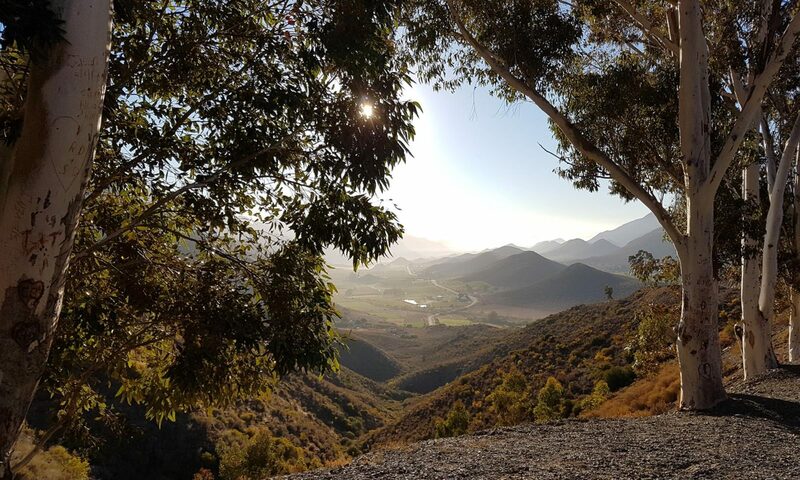 This was going to be a relaxing solo ride on a gorgeous sunny winter’s day, so a quad crunching climb up the hill did not fit the bill nearly so well as a whiz down followed by an easy loosening spin up Old Stellenbosch Road. A cheesy grin was already stuck on my face even before I reached cruising pace out along the R44. Today’s ride would be a gentle 70km odd out to Klapmuts and back – an old favourite route from Argus training rides earlier this year, and one I hadn’t ridden since. Coasting into Stellenbosch, my first reaction to the parked cars scattered both sides of the road was that there must be a school rugby game on. Then I noticed the bike racks hung off the back of pretty much every car and remembered it was the Die Burger mountain bike race today.. What amazing weather I thought for the riders, given the rain and storms of the past few weekends. Our paths crossed a number of times on the road out of Stellenbosch, as the MTB trail zigzagged between farm trails on either side of the R44. The riding was surprisingly easy despite keeping up a reasonable pace, no doubt helped by my training these last few weeks. And somewhere just between Krom Rhee road and Kanonkop it happened. The peace and quiet of riding with only my own inner voice for company caught up with me on the road right there, and suddenly I realised how much I’d missed riding solo: time to sit up and enjoy the view, with no distractions apart from the rhythmic whir of pedals and humming wheel hubs; time to think, and be alone with those thoughts. Something wonderful happened over the remaining forty kilometres or so of riding – a whole host of murky and tangled issues that had been troubling me over the past few weeks unravelled themselves and everything became simple and clear again. It’s something of a cliché to say it was a life changing ride, but in this case it would be absolutely true – quite literally, although exactly why will have to be the subject of a future entry. For now all I can really say is that something else I learned today is that through all the club rides and training, I won’t be losing sight again of the pleasure and enjoyment of the occasional ride alone, for no other reason than the pure pleasure of cycling. Previous PostPrevious What the LEL?